The M.V. JOY is a 12.5m (45 foot) kauri launch capable of cruising at 11 knots. She was purpose built for fishing and has a spacious covered deck for fishing and side walkways to the front of the boat so people can fish up the sides. It has dropsides to shelter you from the wind on the way to the fishing grounds. 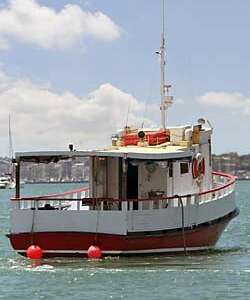 She is licensed to take up to 30 passengers, however we recommend fishing 20 anglers at a time. There is also has an inside cabin seating area and a household toilet system onboard. There is an excellent sound system on board. Tea and coffee are complementary on board, and the use of the BBQ is free of charge. Passengers are welcome to bring their own refreshments along. The M.V. JOY is a boat full of character. She is comfortable, warm and dry. We want people to relax and have fun. Our day trips depart 7am and we return at 4pm. Starting from $65 per person. Our Twilight Trips departs at 5pm and return at 9.30pm. Starting from $55 per person. Our Winter Trips are aimed at catching the large snapper, kingfish and other trophy fish. Departing at 6am we go out wide to bottom of Waiheke Islands and some other secret spots. Starting from $120 per person. Get on the Water! Book Today!